Use the Components Tab on the Object Editor dialog box to control an object’s geometry, shading, and copy options. You may also clean your project of unneeded objects or components. Set an object’s geometry or shading components or its copy options using the Components Tab of the Object Editor dialog box. Object Selection If you have opened the Object Editor dialog box without first selecting an object in the Work Window, select an object to edit from the drop-down menu. (The menu contains all objects in the project.) If you have first selected an object and then opened the Object Editor dialog box, the object name is displayed. You may rename an object, up to 10 alphanumeric characters, by typing over the displayed name in the Object Selection box. Object Displays the type of object selected, such as ellipse, image, imported object, table, etc. Click to open the Geometry Editor dialog box to edit the selected object’s geometry. 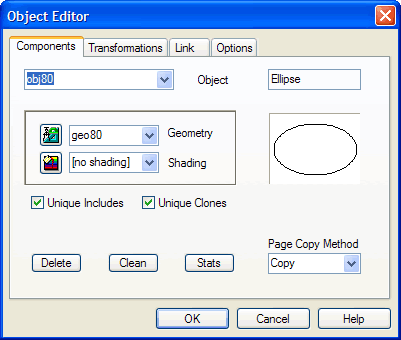 For more information, see Geometry Editor Dialog Box. Geometry Selection If an object is not selected, the Geometry Selection is disabled. If an object is selected, then the associated geometry is displayed. If a different geometry is selected, that will change the object. That is the object that will use the new geometry. Click to open the Shading Editor dialog box to edit and create custom color shadings to apply to objects. For more information, see Shading Editor Dialog Box. Shading Selection If an object is not selected, the Shading Selection is disabled. If an object is selected, then the associated shading is displayed. If a different shading is selected, that will change the object. That is the object that will use the new shading. Thumbnail View Displays the object currently selected for editing. Page Copy Method Select from the drop-down menu the target copy option of the selected object. Choose from Copy, Clone, Include, or Private. For more information, see Target Copy Options. Delete Click to remove the object from the project. Clean Click to remove all unused objects and components from the project. For more information, see Clean Components. Stats Click to open the Object Statistics message box, allowing you to view the current properties settings of the selected object. For more information, see Object Statistics Message Box. Unique Clones Click to checkmark to tell SiteSpinner® Pro to create individual resource files in the published project for the selected object’s clone copies. Click to un-checkmark to share one resource file among the clone copies of the selected object. For more information, see Clone Object. Unique Includes Click to checkmark to tell SiteSpinner® Pro to create individual resource files in the published project for the selected object’s include copies. Click to un-checkmark to share one resource file among include copies of the selected object. For more information, see Include Object.